Located in a sheltered cove with a private Double Decker dock equipped with slide, 1 covered boat slip, and jet ski dock. This place is a water playground. Clean, year-round water provides secluded swimming areas and surprisingly quick access to great ski water. 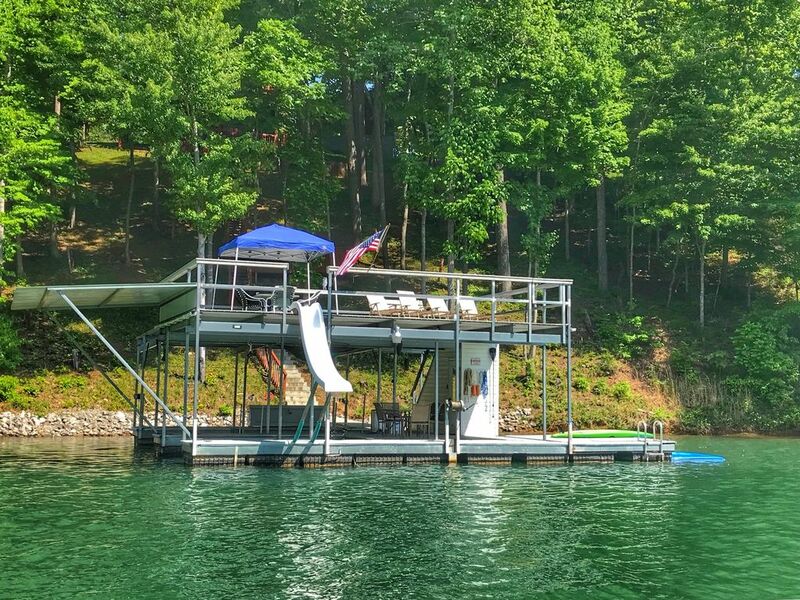 The beautiful "Bent-Ski...Hideaway" provides two large decks overlooking the dock and huge back yard with stunning views of Norris Lake's 'Big Creek'. Enjoy marshmallows on the stone patio with fire pit. Peacefully read your favorite book in the screened lanai overlooking the lake. The lower level provides a large TV room overlooking the lake and two bunk rooms. Each bunk room has a queen and twin bunks ensuring everyone has a comfortable night's rest. A convenient laundry room enables a quick load. Plenty of parking in the long circular driveway right to the front door making unloading a breeze. Please do not hesitate to inquire with questions. We can help you with cabin details and boat rental suggestions. John Bertke lives in Dayton Ohio and enjoys visiting Norris with his friends and family. He enjoys fishing and smoking cigars. He started managing this property in June 2017. The Meacham family have provided a fantastic property. The cabin's open floor plan is quaint and makes a perfect family gathering place. The beautiful backyard leads to a huge dock in a secluded cove. This place is a perfect water playground. This property is an easy drive from Interstate 75 and shopping/grocery including the Liquor Barn. The cabin's dock is tucked back into a protected cove yet is 2 minutes from open ski waters of "Big Creek" near Whitman Hollow Boat Dock (Marina). All bathrooms supplied with towels and hand towels. Large main level Great Room with beautiful cathedral ceilings. Lower level TV room ready for streaming movies or ballgames. Kitchen is fully stocked. .
Large main level Great Room with TV and HBO. Lower level TV ready for streaming. Courses available nearby. Contact us for logistics details. Please contact us for suggestions on golf, watercraft rental, restaurants, etc. We are here to assist you. We had a wonderful time on Norris Lake! This house was the perfect spot for our family of 8 to gather for an end of summer vacation. We had plenty of room, and the 3 king beds were a nice touch for the couples in the group. We used every part of the house: bedrooms, bathrooms, great kitchen, living/dining area, screened porch, back porch, fire pit, dock (both levels, and lake. We even enjoyed daily walks in the neighborhood (and met many of your nice neighbors). We brought groceries to cook, 4 huge inflatable derby ducks and our outdoor movie projector, so we never had to leave the property. Everything about our stay was perfect! Thank you! The House was perfect for our stay and the dock was awesome with the slide and area to relax abd enjoy the lake!